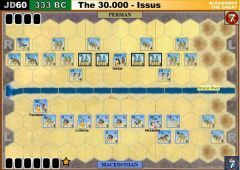 Rather than pursue Darius after the victory at Issus (333), Alexander turned south to neutralize the Persian fleet. 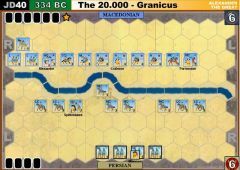 In a two-year campaign he captured Tyre and Gaza, and conquered Egypt. 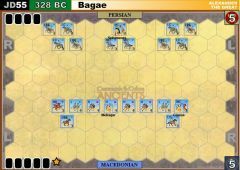 In 331, Alexander marched into Mesopotamia, intent on attacking Babylon. 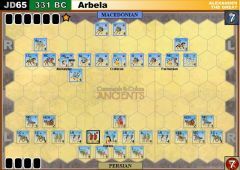 Darius had raised another army, strong in cavalry but lacking in good infantry. 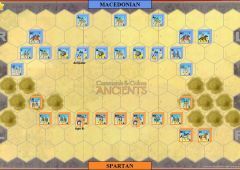 The two armies met on the plain of Gaugamela. 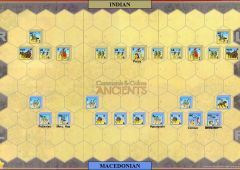 Darius posted cavalry on the right and the left, and occupied the center with his Greek mercenaries, guard cavalry, elephants and chariots. 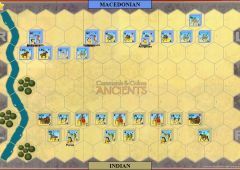 Alexander placed the Thessalian horse on the left, while taking charge of the phalanx in the center and the Companions on the right in person. 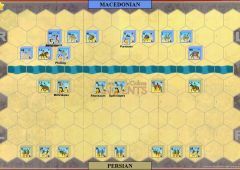 The Persian line extended well beyond both flanks of the Macedonian formation. 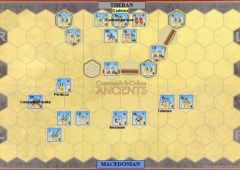 To counter, Alexander moved diagonally as he advanced, refusing his left. 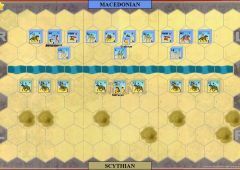 Darius ordered his mounted troops forward. 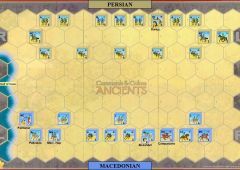 The Macedonian right managed to hold their attackers just long enough for Alexander to charge with his Companions and heavy infantry straight for Darius. 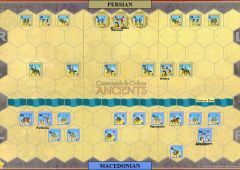 Again, Darius turned and fled the field, but the battle was not quite over. 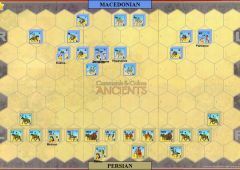 The Macedonian left was still hard pressed by the Persian cavalry. 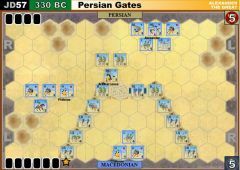 Alexander wheeled about and charged with the Companions into the Persians, forcing them back. 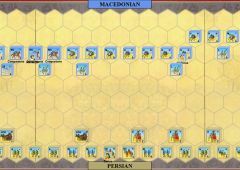 Soon the entire Persian army was in retreat. 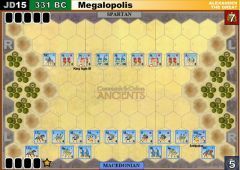 Gaugamela is one of the truly decisive battles of history, and marked the beginning of Alexander’s great empire. 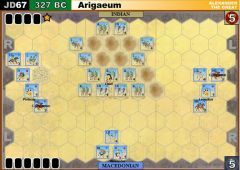 This battle is also considered the classic example of penetration tactics. 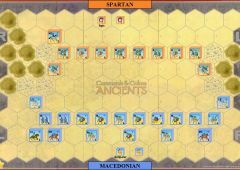 • The Greek Companion Cavalry is a special unit. 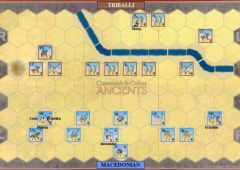 Place a special unit block in the same hex as the Companion Cavalry unit to distinguish it from the other units. The Companion Cavalry will ignore 1 sword symbol in Close Comba and may ignore 1 flag. 2 solitaire games with both sides winning by the score of 7 - 4. 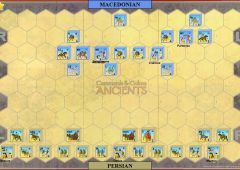 In the second game, the elephant for the Persians led a charmed life in that several times it escaped damage. 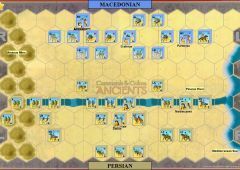 It caused heavy damage to the Macedonian's heavies, and was a major contributor in the Persian victory. 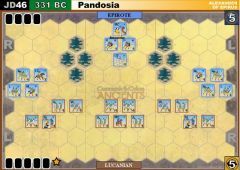 This scenario depends on whether Darius can pull off an envelop-and-crush with the numerically superior Persians befor Alexander punches his heavies straight through, shattering the required number of units on the way. This one is well balanced; Darius being 2 command cards down compensates nicely for his numbers advantage. 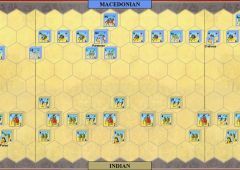 The Macedonians better pray he doesn't get a couple of early Line Commands, though; that could seriously constrain Alexander's room to maneuver.